After months of speculation, guesswork and supposedly leaked photos, the Samsung Galaxy S III is now 100% real. Samsung’s great and good took to the stage in London to announce the latest in the line of Galaxy S smartphones, powered by Android, along with UK TV presenter Suzi Perry. The result was the revealing of a smartphone that Samsung claims is the biggest announcement of the year. A bold claim, we are sure you will agree. The handset itself is pretty much what we expected. It is instantly recognizable as a Galaxy S family device, with the same button layout that we have come to expect from Samsung’s flagship line of smartphones. A glance through the specifications list reveals one or two interesting tidbits, though, and not all of them favorable depending on which side of a narrow fence you happen to sit on. The most striking specification for us has to be that screen. 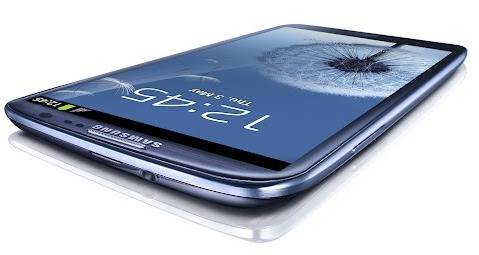 Weighing in with a 4.8-inch Super AMOLED display and 720p resolution, the Samsung Galaxy S III is indeed something of a beast. 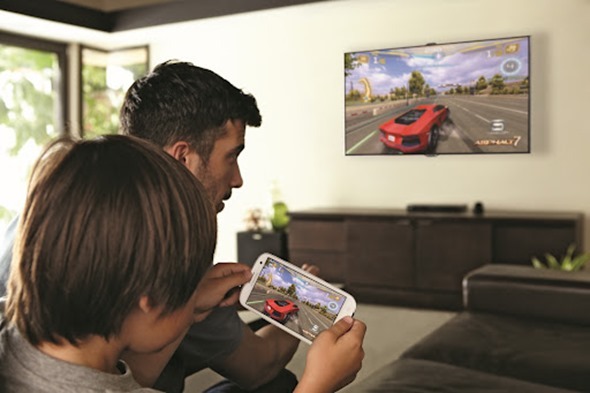 Put beside an iPhone 4S, it is clear that Samsung believes that bigger is indeed better, and if you’ve got the hands of King Kong, then it is fair to say you’ll agree. But is it really that easy to live with? Samsung’s own 5.3-inch Galaxy Note is probably the largest handset being marketed as a smartphone right now, and even then the Korean company’s own marketing pushes the thing as a cross between smartphone and tablet – branding which has the unfortunate side effect of making the phone seem more than a little schizophrenic. C’mon guys, that’s marketing 101 right there. But back to that massive 4.8-inch screen. One plus that we have to level at the screen is the fact that it means Samsung can include a relatively large 2,100mAh battery, and battery life was something that Samsung itself spoke about during its reveal today. The cynics amongst is would suggest that the handset is so large because Samsung needed to pack in such a massive battery to make the 4G version – available in the US, Japan and Korea this Summer – last long enough to be useful. An 8-megapixel rear-facing camera and 1.9 megapixel front-facing affair should be enough to keep photographers happy, though the quality of the camera software will determine whether the iPhone 4S has anything to worry about in that department. No CPU specs were given during the announcement, which leaves the software as the standout feature here. Samsung seems to be trying to differentiate itself from other Android-using OEMs by packing new and interesting software into its handsets. It is here, assuming they haven’t broken Android at the most fundamental level, that the Galaxy S III could potentially shine. Although, Samsung announced beforehand that the CPU which would power the Galaxy S III would be the Exynos 4 Quad, so indeed it is that processor. Take ‘Smart Stay’ for example. According to Samsung’s blurb, this feature will track a user’s eyes and alter the screen’s brightness to reflect their attention. ‘S Voice’ is Samsung’s Siri clone, which is interesting to say the least considering the company’s current spat with Apple. Other software-based features include voice recognition that will allow the phone to tailor commands to users, and various DLNA features that some will no doubt use a lot, whilst others barely notice. All in, and these are still very early days for the Galaxy S III, the handset appears more iterative than revolutionary. With the main competition, Apple’s next iPhone, due to be announced in six months, Samsung may not have pushed the boat out far enough to really push its rival to the limit.